In April 2018 W.Bro. 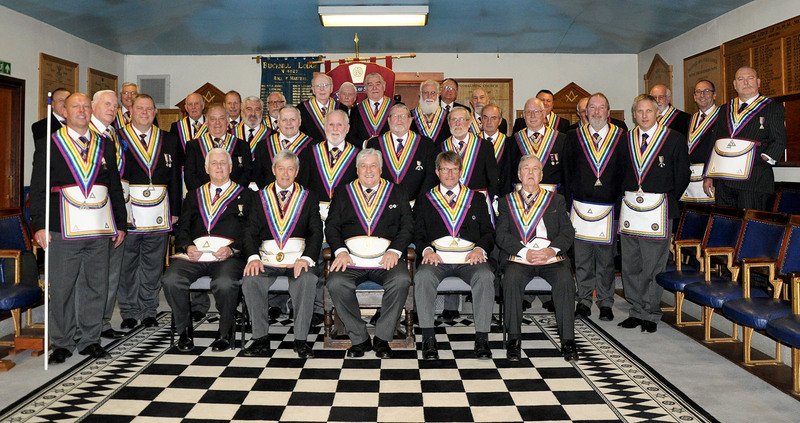 John French, Assistant Provincial Grand Master, together with a number of Provincial Officers made an Official Visit to Pleydell Bouverie Lodge of Royal Ark Mariners and Pleydell Bouverie Lodge of Mark Master Masons No. 955. Also present was W.Bro. Chris Eley, Assistant Provincial Grand Master, a personal guest of David Bleming. Chris and David have known each other for many years. The afternoon started off with a short Royal Ark Mariners meeting where the Worshipful Commander, W.Bro. David Bleming, welcomed the Assistant Provincial Grand Masters and the Provincial Officers. 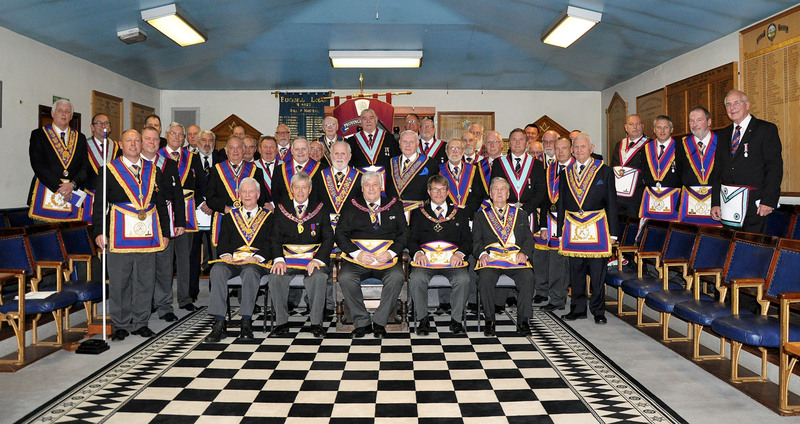 A Lodge of Mark Master Masons was then opened. The Provincial Assistant Grand Director of Ceremonies, W.Bro. Mark Guzam, was admitted and advised the Worshipful Master, W.Bro. Ross Clark, that the Assistant Provincial Grand Master, W.Bro. John French, was in the ante room and demanded admission to the Lodge. The Assistant Provincial Grand Master entered in procession with the Provincial team, was presented with the gavel and took the Chair. The Assistant Provincial Grand Master spoke about the 2022 Festival, introduced the Provincial team and took the minutes. After the Assistant Provincial Grand Master had vacated the Chair the Worshipful Master installed Bro. David Bleming into the Chair of the Pleydell Bouverie Lodge of Mark Master Masons in an excellent manner. The Address to the Master was given by W.Bro. Chris Eley, to the Wardens by W.Bro. Howard George, to the Overseers by W.Bro. Clive Newman and to the Brethren by W.Bro. John French. 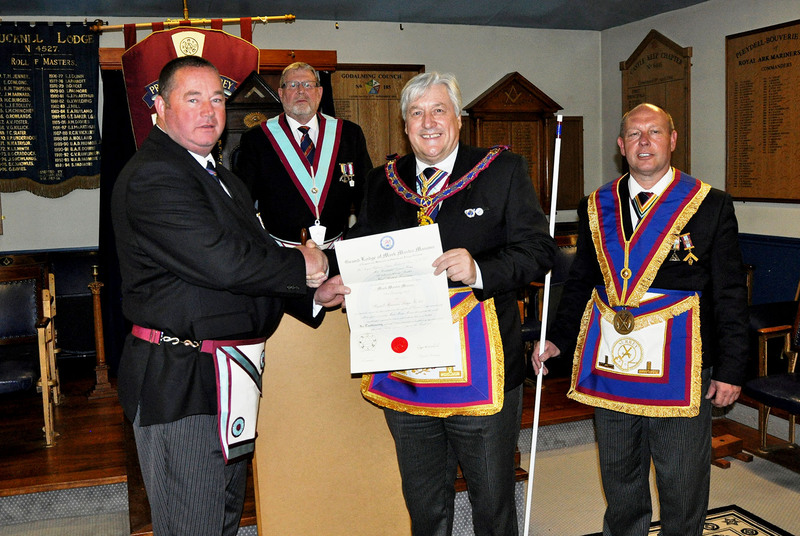 The Worshipful Master invited the Assistant Provincial Grand Master to present a Grand Lodge Certificate to Bro. Nigel Foreman. This was done in a most interesting way. After the customary photographs the Brethren of Pleydell Bouverie Lodge and their guests sat down to a most enjoyable Festive Board at the Godalming Masonic Hall. 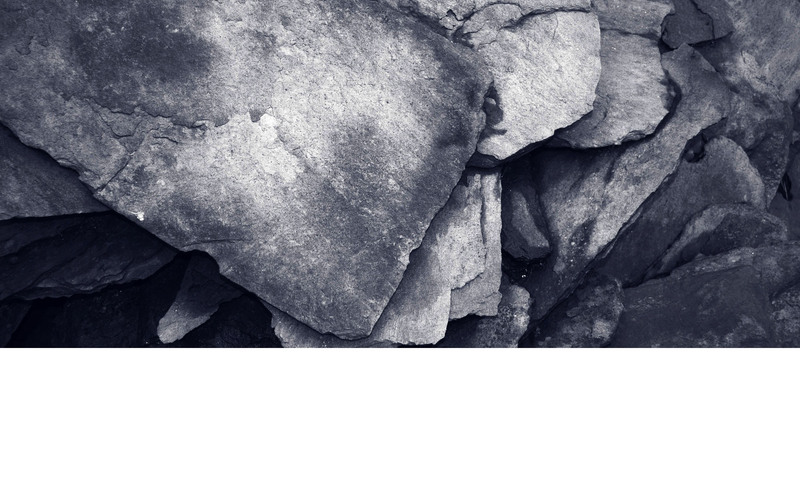 Pleydell Bouverie Lodge is a member of the Onslow Group whose Lodges meet at Godalming and Guildford and an open invitation is always there for other Brethren to join their meetings.